Even though the band’s multi-part epics fell flat on their face in “Caress of Steel”, Rush deserves credit for sticking with it in the face of record company pressure, and acclaim for their latter (and much better) pieces shows they were indeed onto something. The band when into their recording of “2112” feeling they had nothing left to lose, and if they were going to go out, they were going to go with a bang. 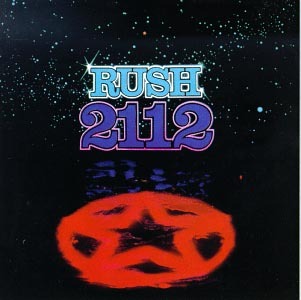 “2112”, the multi-part piece that would encompass all of side one of the album, has always felt to me like a metaphor for the band’s situation at the time. The loose plot (explained at length and in more detail in the band’s liner notes) is set in the year 2112 when the Red Star of the Solar Federation rules all of the planets engaged in war to control all the planets in the galaxy. Their agents, the Priests of the Temple of Syrinx, control society with an Orwellian fist, determining the content of all literature, music, and pictures. Our protagonist finds an ancient guitar in a cave under a waterfall and learns to create his own music, showing it to the Priests thinking it will be a boon to humanity. Instead, they coldly dismiss it, saying such “silly whims” destroyed the previous civilization and it “doesn’t fit the plan”. Devastated, the protagonist has a dream where an Oracle visits him and shows him how life was before the Solar Federation took control, when the Elder Race ruled and creativity flourished. When he awakens, he finds his life empty and meaningless without these things, and commits suicide in despair. At the end of the “Grand Finale”, an ominous voice states “Attention all planets of the Solar Federation: we have assumed control”. Of that final line; Geddy Lee apparently felt it meant that the Solar Federation had eliminated the last bit of the old culture and crushed it beneath its boot. Neil meanwhile (the writer of the original lyric) intended it to mean that the Elder Race had returned and brought back the individuality that the Solar Federation had hoped to squash. Whatever your feelings on the ending, these two different interpretations showed how things could go either way for Rush at this stage in their career. Either their album would be a success, or it wouldn’t sell and they’d become irrelevant because they “didn’t fit the plan”. In any case, Rush’s themes of individuality and fresh expression would become fully realized with the “2112” track, and they would finally find their own voice in its composition. Instead of the aimless fantasy lyrics they had done previously, Neil came in with a tight, thought-out science fiction-themed allegory for the band’s current situation. The band also tightened up their composition, bringing their A-game and fully thinking through every section of the song. “Overture” opens up with synthesized white noise, showing we’re in for something completely different before going from zero to sixty with the band’s riffs. If Rush was going down, it wasn’t going without a fight. In fact, knowing the fights they had with their record company at the time, “Temples of Syrinx” sounds like the band shaking it’s fist as people who want to control “the words you read and the songs you sing”. “Discovery”, meanwhile, shows Alex Lifeson’s evolution as a guitarist, conveying the protagonist’s discovery of his instrument and how he learns to play it, all without one lyric. It’s well-thought aimlessness, even expressing in the music how he learns to tune and make melody with it before presenting it to the Priests. Personally, “Soliloquy” was always my favorite part, showing a culmination of Alex’s dreamy, phase-shifted guitar from this era, ending the protagonist’s journey with bittersweet heartbreak. …So that’s the title track. But what about the other five songs on the album? The ones that don’t have anything to do with the titular concept? Well, first song on side two is “A Passage to Bangkok”, a song thought to be about trafficking hashish. It has a tight riff, a tight solo, and the Oriental references while a tad cliched actually work, and perhaps show the band wasn’t taking itself as seriously by now. The song would remain a concert favorite through the “Moving Pictures” tour and recently made a comeback on the “Snakes & Arrows” tour, to fan’s surprise and delight. “The Twilight Zone” actually opens with a crying solo by Lifeson and an early version of Neil’s famous drum rolls. A more ominous tune, obviously tributing the TV show of the same name, it even references two specific episodes in the first and second verse, respectively. At this point, sci-fi themes are working much better for the band than fantasy was, so I encourage it. “Lessons”, solely composed by Lifeson, has a folksy bounce similar to “Making Memories” on the “Fly By Night” album (the opening lyric is even “Sweet memories…”). It’s not bad, but it reminds me too much of their earlier, weaker material. After showing what they could do with the title track, it seems regressive to go back now. “Tears”, a straight acoustic number composed solely by Lee, fares a bit better. With Neil in his corner for lyrics, he fares better than with his solo works on previous albums. The gorgeous mellotron is also contributed by Hugh Syme, the first outside musician featured on a Rush recording and their art director for all albums after this. The album closes with the biting political track “Something For Nothing”. Again solely composed by Lee but with more electric contributions by Alex, Neil’s lyrics hit the right indignant tone, and it’s a strong way to close the record.